The average person requires 7 -10 hours of sleep per night according to the National Sleep Foundation. But is it possible that using different sleep cycles, where the benefits of sleep are still achieved, we can sleep less? Much less? Most of us are familiar with what is called a monophasic sleep cycle. This cycle is used by most people as it’s what we hear about and learn the most. For some, this cycle is practical although inefficient. Fact is, there are 4 other sleep cycles that can provide all the benefits of sleep, while sleeping much less. For me, this is good news as I am not a huge fan of sleeping for long periods of time. Why? Generally there are better things to do! Not only that but sleeping has always been something I wish I could do when I felt like it and not because I’m ‘supposed to.’ if I could spend less time lying awake at night trying to sleep, then great. 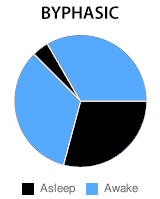 So let’s learn about polyphasic sleep cycles! Unlike monophasic, where you sleep once a day, polyphasic cycles utilize multiple naps. The Monophasic cycle consists of various stages of sleep with REM (rapid eye movement) being the most important. A person using a monophasic cycle might go to bed at night (around 11PM), sleep for 7 – 10 hours and then wake up in the morning. Of course if one worked a night shift, timing would be swapped. Generally, it takes the body about 45 – 75 minutes to get into REM sleep which is the cycle responsible for various brain and bodily functions that are beneficial to health. Although scientists don’t understand exactly why we need sleep, it has been recognized, while observing animals, that sleep is needed for survival. Read more. The Byphasic cycle, also called the Siesta, is the most common of polyphasic cycles as it can be viewed as the most practical for people. This cycle consists of one 5 – 6 hour sleep and one 20, 60 or 90 minute nap per day. Total sleep time is around 5.3 – 10 hours per day. In regards to health, compared to the monophasic cycle, there is now enough scientific research to show that this cycle is not only better for your health but can also lead to better moods, a decrease in stress, an increase in your ability to be altert as well as overall productivity. Some research even states this cycle can make you smarter! Read more. The Everyman cycle, first named by Puredoxyk, is a sleep schedule consisting of one 3.5 hour core sleep and 3 x 20 minute naps spread out over the day. The cycle is designed to counteract the natural drops in our alertness as dictated by our Circadian and Ultradian rhythms. A sample schedule commonly used with this cycle is sleeping 9 – 12:30am, a 4:10am nap, an 8:10am nap, and a 2:40pm nap. Avoid having a morning core sleep (3am – 6:30am) as during these times it is unlikely you will get quality slow wave sleep because your temporary circadian REM pressure is high. Read more. 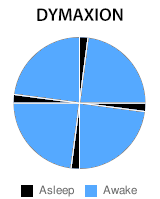 The Dymaxion cycle is said to be the most difficult as it can only be successfully used by certain people. Those with the DEC2 gene, also called ‘short sleepers,’ generally only require about 4 hours of monophasic sleep, which makes this cycle possible for them. This isn’t to say others can’t use it, it is simply unlikely it will work. There is not enough time spent in REM for most people so the cycle is tough to adapt to. The cycle consists of 4 x 30 minute sleeps throughout the day which totals only 2 hours of sleep! Some have adjusted the cycle to reflect a pattern of one 1.5 hour sleep with 2 x 30 minute naps and one 20 minute nap. Read more. 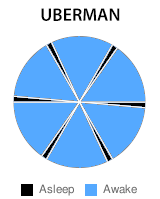 The Uberman cycle, again name by Puredoxyk, is a sleep schedule consisting entirely of 20 minute naps totalling 2 hours of sleep per day. 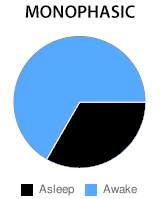 Each nap is spaced equidistantly throughout the day. The classic method is to take 6 x 20 minute equidistant naps per day. Alternatively, people can take 8 x 20 minute naps, also spaced equidistantly throughout the day, as the extra 40 minutes each day can make a big difference. Some report that missing naps while on this schedule can result in feeling very drained and tired, so keeping to the schedule is important. This of course might be difficult depending on your schedule, so take that into consideration if you decide to give this a try. One cool note for this cycle is that many Uberman sleepers report experiencing very vivid lucid dreams. This cycle might be worth a try for those experimenting with lucid dreaming. Read more. When I first heard of the possibility of different sleep cycles I got excited. So for me, I am definitely going to give one of these a try. 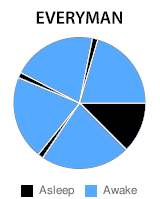 As of now I will likely start experimenting with the Everyman cycle. Either way you go when it comes to swapping sleep cycles, it seems the only one that requires very little adjustment of your body is the Byphasic. Each of the others will likely require a 2 week period of integration before you fully recognize the nature of the cycle. If you decide to give them a try, don’t be hasty in giving up! Feeling like a zombie after the first few days is a possibility, but with the proper adjustment things could work out. Keep your current lifestyle in mind before choosing a different cycle. Is it going to be possible for you to have naps throughout the day? Don’t be afraid to push your boundaries, but remember practicality. It has been said that eating healthy/clean foods helps with the adjustment process. It’s also recommended that you get a good alarm and make it your friend. When you first begin changing your cycle, you will need it to stay disciplined, so do your best to keep on track with your sleep and wake up times. When you do sleep, try to be in a dark setting. When you awaken, try to expose yourself to sunlight for a few minutes. Remember, don’t give up right away! If you have had experiences with alternate sleep cycles, share them below. I am going to be blogging, in great detail, about my experience with the Everyman cycle.